Use digital signatures to manage SAP Supply Chain Management (SCM) processes. They can save companies time and money, says SCM expert Jawad Akhtar. The process of integrating digital signature with existing SAP supply chain processes is relatively easy, and it eliminates the need to sign hard copies of many documents. Companies often overlook the fact that the software giant offers SAP Digital Signatures as a feature of its standard ERP offering. When implemented, it can significantly reduce the amount of time associated with manual and paper-based approval or information validation processes. Digital signatures have turned out to be a complete and effective alternative to the manual signature option. It also saves time and resources because it all takes place within the SAP system. Organizations interested in SAP Digital Signatures need to decide which SAP modules to use with the technology. The actual digital signature configuration in SAP does not take more than one to two days of work. But the amount of time spent deploying digital signatures across the enterprise will depend on the overall scope and size of implementation; the number of business processes in which the company would like to implement digital signatures; the time involved in testing and training users; and the time it takes to handle change management tasks designed to steer relevant users away from the paper-based signing to digitally signing in SAP. Should you be on SAP SCM 7.0? Employees or consultants with digital signature expertise can manage the authorization issues, but the actual process of digitally signing in SAP entails users entering a password into SAP. The option for a single digital signature or multiple and sequential set of digital signatures, to reflect various signing authorities, is also available. A SAP Digital Signature can also integrate with SAP Workflow, which ensures that the relevant SAP user has access to a list of all the SAP documents requiring digital signature. Digital signature is cross-modular, which means that companies can implement those signatures across a range of modules, including the supply chain modules. In SAP production planning for process industries (PP-PI), the digital signature validates and confirms individual entries made in the process instruction (PI) sheet. A PI sheet records important information about plant parameters. A company can decide at which level such validation should take place. For example, when the entered parameter value is outside the defined tolerance limit, the system triggers a digital signature to confirm the entry by requiring a user to digitally sign it. Alternatively, it can activate digital signature when the PI sheet is marked as "complete" after all plant parameter values in the PI sheet are entered. A completed PI sheet does not allow anyone to make further changes. If multiple signatures are required to mark the PI sheet as complete, then the digital signature in the signature series confirms the completion of the PI sheet. In the SAP Plant Maintenance (PM) module as well as the PP module, the company requires the maintenance or production personnel to create a shift report in SAP at the end of a shift. A shift report consolidates information on all the important activities of the shift. If you do not implement SAP Digital Signature at all, the user is required to sign a hard copy or printout of the shift report. Once you implement SAP Digital Signature in a shift report, the printout is only possible after the Digital Signature is in place. The options to send the shift report as an email attachment or to create an Adobe Acrobat (PDF) version in SAP becomes available after the user digitally signs it. In the SAP Quality Management (QM) module, digital signatures integrate three important processes including the recording of results, the decision to use a material (usage decision in SAP QM) and the sample drawing for physical samples. In each of these processes, the entries are confirmed after the user digitally signs them. 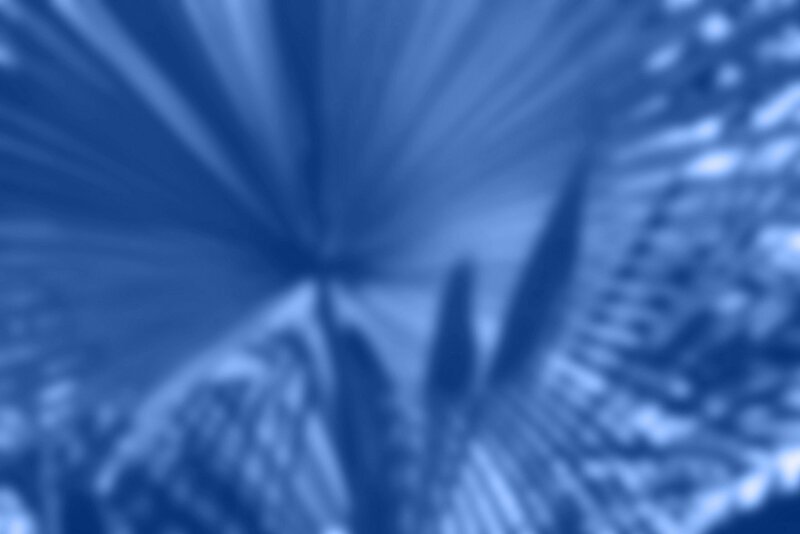 Without the requisite digital signatures in place, the system marks the respective business process as incomplete. Digital Signatures can also be used in a company's SAP Document Management System (DMS), a central repository of all the digital assets of a company. Whenever a user changes the status of a DMS document -- for example, from in-process to released, -- the system prompts the user to digitally sign the DMS document before changes in document status are incorporated. Refer to the figure below in which status change triggers digital signature. Figure 1. The second individual signature in the two-signature process. 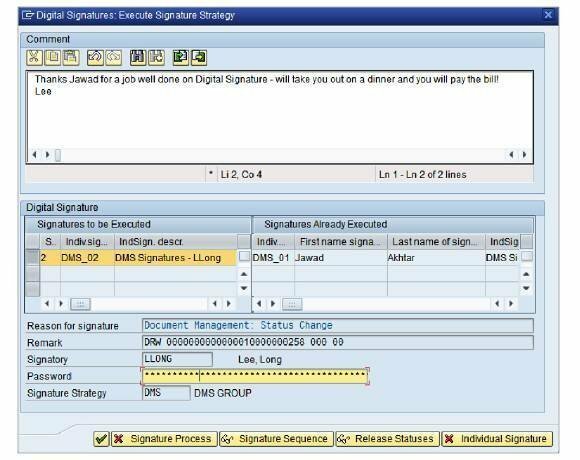 The figure below shows that the SAP DMS document needs multiple digital signatures. The signature strategy is defined in the system in such a way that it needs two signatures in succession to enable the system to make changes to DMS status. It's akin to having an assistant manager first sign a document before the manager signs it. Notice at the lower right-hand side of the figure that the first individual signature, DMS_01 (with the username Jawad Akhtar) is already executed under the heading 'Signature Already Executed.' On the lower-half of left hand side, the user selects the individual signature DMS_02 (with the username Lee Long) and enters the SAP password. The user can also incorporate comments/remarks during signing, as noted in the top-half of the figure. To integrate digital signatures within existing business processes in SAP, the company needs to engage an SAP consultant if it does not have the necessary skills in–house. In either case, that person will undertake the necessary configuration settings of digital signature in the system and then assign it to SAP business processes of PP, PM, QM or DMS modules. SAP NetWeaver (Basis) expertise is also necessary, because someone will need to authorize concerned persons or departments to execute digital signatures. Finally, if the company decides to integrate digital signature with SAP Workflow, expertise in that technology will also be required. Does SAP Digital Signature functionality cover MM processes (e.g. PO approval)?